On June 6, 1944, Clyde Combs was aboard PT 515 looking upon history’s largest amphibious landing before dawn. All he could hear was the constant drone of U.S. and Allied bombers flying above, thunderous shelling from nearby battleships. About one-third of a mile away, soldiers waded to shore. Combs was a nineteen-year-old quartermaster on the speedy PT boat, one of dozens lined up on D-Day to guard the western flank of the invasion force that marked the beginning of the end of Germany’s occupation of France and Europe. In his upscale west Houston townhouse he shares with his wife, Virginia, Combs, 88, told me the story of his life before and during the great war. I learned about PT boats, speedy eighty-foot-long boats made of mahogany that FDR insisted the War Department build at a time that U.S. Navy more favored big battleships. 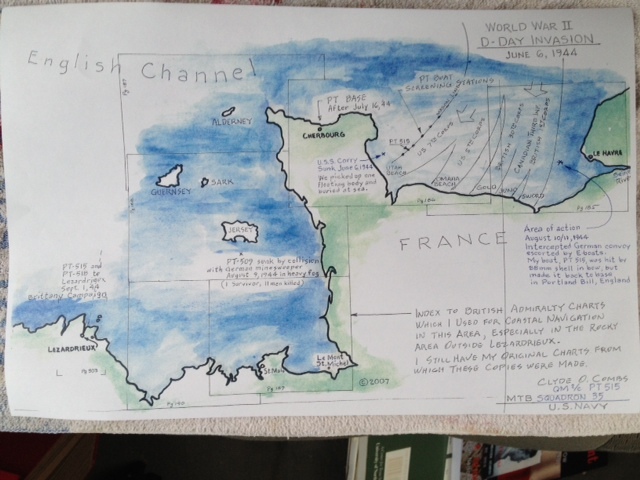 Combs gave me a copy of a drawing he made of the D-Day invasion showing where his boat was stationed and then other encounters his PT 515 was involved in during the ensuring months off the shores of Normandy. It’s hard to make out on this copy, but Combs noted on the drawing his boat picked up a dead seaman floating in the channel later in the day on June 6 following the sinking of the USS Corry destroyer, which struck a German land mine. There is one PT boat left running and it was proudly restored by former sailors like your Mr. Combs. I believe it is in Washington state or Oregon but I may be wrong. Yes! Clyde told me he got to get on the controls and steer along on a short trip, going just 4 knots or so. It’s in Oregon, he said.